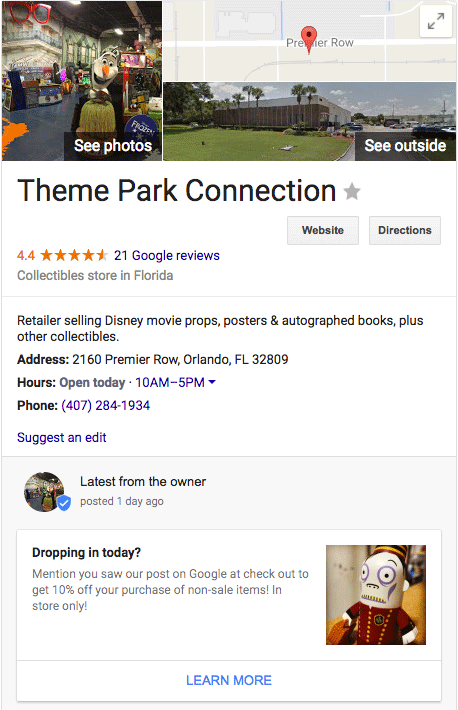 Mike Blumenthal posted on Twitter that Google is showing a new feature for at least one business in their local knowledge panel box. This feature allows the business owner to list a promotion or marketing message to those reading the box and it adds a "learn more" button that leads to driving directions. Under the local details, there is a box that says "latest from the owner" and then he has a promotion about saving 10%. I am not sure if this is related to the Google Posts feature or something else. Google has not responded to our two attempts to get a comment about this.